Get 100+ Top Php Script for any Project To Start any type of project like, Chat Service, Classified, Realestate, Job, Web Directory, Visitor Counter Site, Traffic Gopher, Traffic Generator, Traffic Exchange, Top Sites 4.1, Submit Force, Snippet Master, REV-Share Pro, Realestate 202, Pixal Ad Raptor, PHP Job Sites, PHP Football, PHP Auction, Classifieds HYIP, Auto Surf And The List Goes On And On. Most All Scripts Comes With Install Directions . No need to pay by per script, get full package in small amount. 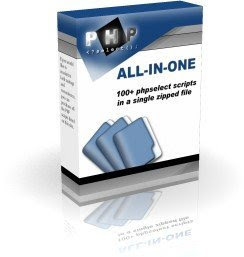 Get 100+ Top Php Script for any Project is ranked 5 out of 5. Based on 2 user reviews.